I can’t believe how time has sped past us. It seems like yesterday when I was scribbling away a storyline for the Among Us Trilogy. 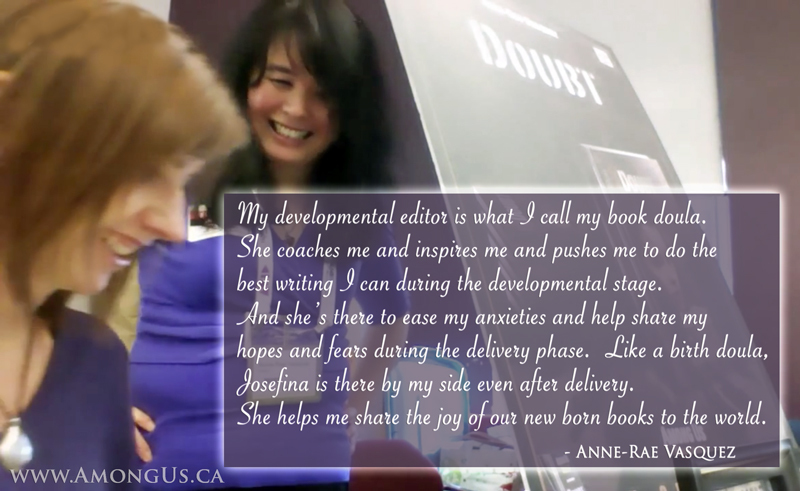 I can even remember how nervous I was to ask Josefina if she’d even consider being my developmental editor. She’s a hard sell, if you know what I mean. But my nerves eased once I began rambling about my ideas and how I foresaw the characters stumbling upon the realization that there are spiritual beings living among them and how they react to that fact. Once my ideas were laid out in a breathless whirl of excitement (you see it was the first time I was sharing my story with another human being), I was met with Josefina’s frown. “Well?” I said. “What do you think?” I’m sure it sounded as defensive as I imagined it. She paused, nodded her head still not saying a word. I felt the anguish bubbling up inside of me. I had been so sure she’d “get” it. When I thought she would give me a litany of reasons why my ideas were horrible, she picked up a pen and a pad of paper and said, “Okay, I’m liking it. And if I’m going to be your developmental editor, this is how we’re going to do it.” She began scribbling the timeline and storyboarding everything I had said. That very moment was the conception of the Among Us Trilogy. It has been two years since that moment and we have celebrated publishing books 1 and 2, letting them loose into the world. If you’re wondering why I say “we” instead of “I”, there is a simple answer. Yes, yes… it’s time to confess. The writing of the Among Us Trilogy is a team effort. I write and Josefina critiques and then she makes me rewrite… a lot. This process is repeated religiously for every chapter. And to add to this we have beta readers to do even more critiquing. Which means, yes, more rewriting for me. Why not the lone ranger approach? Why go through all this pain? Wouldn’t it be faster to write out the whole story and then send it out to an editor afterwards? I know my stories are obscure and completely out there. I write from a place where characters and stories have their own life and just want to get out onto the paper. Josefina helps me rein in on these ideas and adds her magic editorial makeovers so that readers could fully enjoy the stories and the characters. My developmental editor is what I call my book doula. She coaches me and inspires me and pushes me to do the best writing I can during the developmental stage. And she’s there to ease my anxieties and help share my hopes and fears during the delivery phase. Doubt and Resist are not just books. They are our babies. Like a birth doula, Josefina is there by my side even after delivery. She helps me share the joy of our new born books to the world. Like proud parents, we are so happy when a reader gets “it”. And yes, we know not everyone will think our “babies” are beautiful but that’s okay. There are enough of you out there who will share our perspective and we hope you will continue being curious about the books we’re producing. And in the vein of sharing, I want to tell you about a fantastic book in the Amazon Best Seller List which is currently for free. 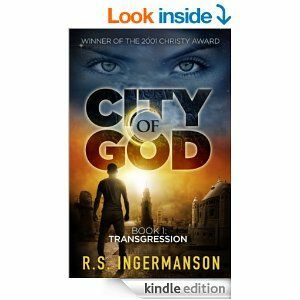 I want to share with you a wonderful book from the City of God series by R.S. Ingermanson which is currently free on Amazon today. Click the link below to grab your copy because I’m not sure how long it will be free for. Okay, since you seem to want to stick around some more, here is how me and my wonderful team ended 2014. We were featured on Digital Journal with Nicole our Fiction Frenzy TV creative consultant and also our author friends and guests. Grab a bag of caramel popcorn or caramel carrot sticks (whatever your fancy) and enjoy the show. The final episode of the year for our show Fiction Frenzy TV was inspired by a documentary film of a man walking backwards in Tokyo filmed in reverse. The completed film is nine hours in length.